Friend of mine was celebrating her Baptism. That’s what she wrote. 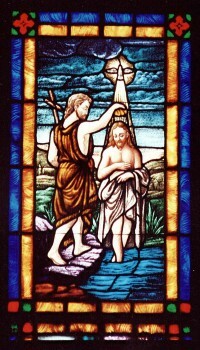 Today is the anniversary of my baptism. On this day the Triune God killed me, a broken creature and made me alive, to live as a new creation. On this day my God saved me from the slavery of the devil and made me his child. On this day he cast all evil out of me and made me a place in which the Holy Spirit dwells. On this day, God took me, stained with the filthy rags of my sin and washed me clean with the blood of the lamb, clothing me in gleaming garments. On this day God took me out of darkness and placed me in the beautiful light of his presence. On this day God gave me trust in his death and resurrection so that I look forward to the day of his return. On this day, the day of the Lord, God will judge me as one who is dead to sin and completely liberate me as one who is alive in Christ. On this day I will no longer struggle with my brokenness and the brokenness of all creation, for I with the entire body of believers, and the whole of creation will be free to be that which God created it to be; with him in perfect relationship. For that day, who could wait? Father, let us live in the confidence you give your children through our baptismal promises, until that day! ← Let’s keep ‘un-masking’ in July!